Over the next several weeks I am going to write a bit more about Bethlehem Steel and Bethlehem, Pennsylvania (and eventually Bethlehem Steel aka Lackawanna Steel, Buffalo, NY) because so much of this Bethlehem’s story is unknown outside the area. For now I will simply say, that at its manufacturing height, Bethlehem Steel Corporation was the United States’ second-largest steel producer and the largest shipbuilder. The plant put out steel that went into bridges, rail, locks and dams, buildings, ships, roads and airplanes around the country – and in some cases around the world. The company finally went bankrupt in 2001, its’ assets sold to investment bankers in 2003 and resold in 2005. This ended American ownership of the assets of Bethlehem Steel. 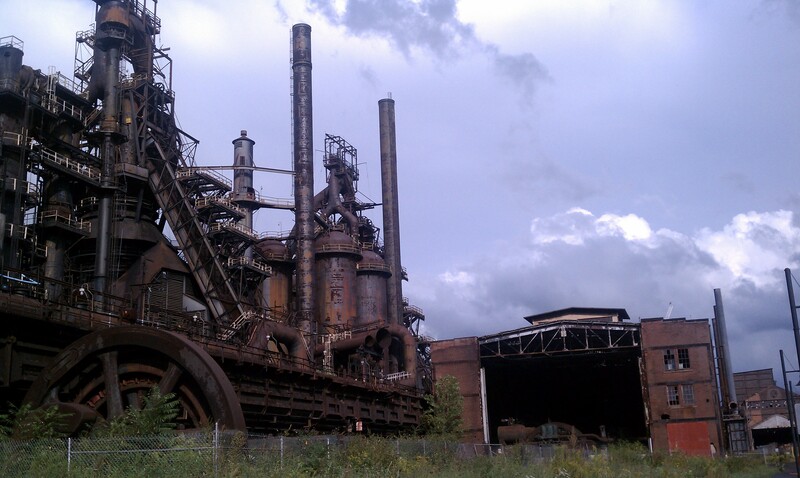 Today the ghosts of Bethlehem Steel are owned by ArcelorMittal. A company owned and headquartered in India. The loss of Bethlehem Steel economically crushed east central Pennsylvania and Buffalo – and all the businesses that did business with them, for them and near them. On the plus side Sands Casinos built another casino on the site in Bethlehem. So there is that, right? I wonder where they bought the steel to build the parking garages, road improvements and buildings. My parents are originally from Bethlehem – both of my grandfathers worked at the steel mill. I remember, as a girl, riding across the bridges that dissected the plant and being able to see inside. I’ve only been back once since the casinos were built – it’s heartbreaking. Great photos – thanks for sharing! I agree. A whole manufacturing economy turned into a service economy. Twice the hours, half the pay. Consumption vs. Production…I fear it will be our downfall. Hey Sean, great articles! Can you please contact me about the possible use of one of your photos? jacobhmoore [at] yahoo. Thank you!